All our pressings are custom-made to order by our sister company, ARCHITAL Architectural Aluminium — see www.archital.co.uk. As well as cills, trims and covers, they also do rainscreen cladding and commercial-scale aluminium fabrication. We manufacture powder-coated aluminium window cills, plus trims such as soffits and corner-post covers. All our aluminium pressings are made to order in bespoke sizes. There are no standard sizes or stock items. Please note: we don't currently offer a survey or installation service for aluminium cills & pressings. All pressings are made to measurements which must be provided by the customer. 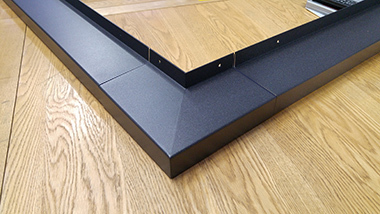 Our cills are made from 2mm (3mm on request) sheet aluminium and polyester powder coated (PPC) in your choice of colour. We can supply most standard RAL colours and also various metallic, textured and anodised finishes, allowing us to match the majority of aluminium-clad window frames. 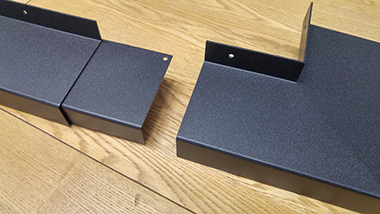 If you are in a coastal or exposed location we can supply pressings with a "marine finish". The aluminium undergoes a special process prior to coating to provide extra protection in a salty environment. Delivery is approximately two weeks after the order is agreed and confirmed and payment received. Shipping may be on our own transport or by a parcel delivery company. The maximum length of any single piece of cill or trim is 3 metres — longer lengths are supplied in two or more pieces with a joining strap. The projection (see measurement B below) can be almost anything you want (within reason). For bays and corners, we make a mitred, welded and finished corner piece. We supply joining straps to provide a seal between the corner and the main lengths of cill. Silicone sealant can be applied to the joining strap to create a waterproof seal. 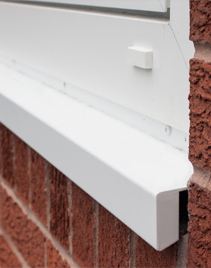 The joins with the corner piece also provide a certain amount of tolerance on the angle – what we call "wiggle room"– to ensure the cills fit the bay comfortably. Builders don't always get the angle of the corner spot on! Corner pieces can be made to any desired angle. 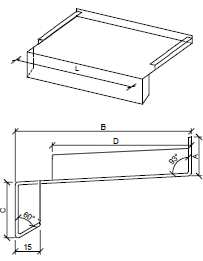 When ordering, please state the overall length of each cill into the inside corner, and we will work out appropriate sizes for the corner piece (click here for diagram). Download our Cill Types sheet to work out which model is best for your application or see the diagrams below. If you are not sure which type to order, Type 1 is by far the most popular. Download our Cill Order Form, marking which sill type you require in column 2 and listing the dimensions. 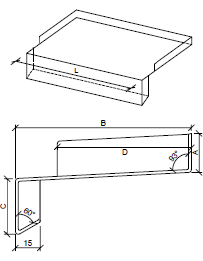 For trims, soffits and other custom pressings, please supply a sketch or drawing with the dimensions clearly marked. This guide is only intended to be a rudimentary guide. You are responsible for providing correct measurements and the sills will be made to those measurements. No refund will be offered if the sills do not fit unless there is an error in manufacturing. If in doubt, consult your builder or designer. The upstand is the part at the back and is supplied with screw holes for fixing to the packer underneath the window. The size of the upstand depends on the window design and the thickness of the packer under the window. We like to do ours at 15mm but others prefer them at 30mm and the choice is yours. Colour-matched screws are available on request at the time of ordering. This is the measurement from front to back of the cill. 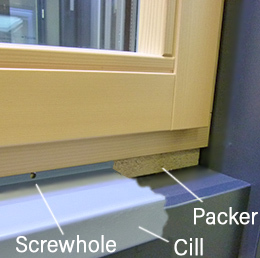 Our sills are designed to be screwed to the packer underneath the window. You need to measure from the packer to the front of the window opening then add whatever overhang you want beyond the opening. It is an aesthetic choice — the minimum is 20mm (which allows for the drip return) but you can have more overhang if you prefer. We usually specify ours at 25mm which we think looks fine in most window openings. This is an aesthetic choice, but if you are not sure, 30-40mm usually looks fine. A 15mm drip-return will be added to the downstand. To get the length (L) you need to measure the distance between the sides of the window opening. You then need to subtract 2 or 3 mm for tolerances and expansion. Measurements are always best taken after any plastering or rendering is done. If you are measuring before rendering, knock off enough for the depth of the render to ensure the cill will still fit. You also need to subtract 2 or 3 mm for tolerances and expansion.